Opened by CalArts in 2003, REDCAT (Roy and Edna Disney/CalArts Theater) introduces diverse audiences, students and artists to the most influential developments in the arts from around the world, and gives artists in this region the creative support they need to achieve national and international stature. REDCAT is the newest partner in an international network of adventurous art and performance centers, which together are playing a vital role in the evolution of contemporary culture. 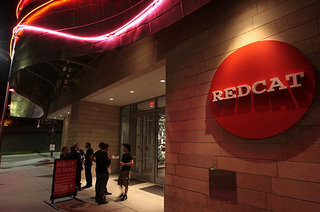 REDCAT is a center for experimentation, discovery and lively civic discourse.